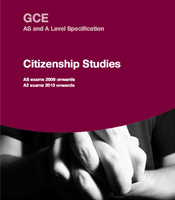 We are not developing a new A-level Citizenship Studies qualification due to government changes to A-levels. The last exams for students taking the current qualification were in the June 2018 series, with a final re-sit opportunity in June 2019. As an alternative, you may like to consider our new AS and A-level in Sociology or Politics. A-level Citizenship Studies helps students communicate and articulate different views, ideas and perspectives. It develops their ability to work with others and use problem-solving and critical approaches to issues. This four-unit specification requires students to develop their ability to advocate, negotiate, plan, make decisions and take action on Citizenship issues. It enables students to select, interpret, analyse and evaluate information to construct reasoned and coherent arguments. This course is particularly suitable for students who have studied the Citizenship Key Stage 4 programme of study as part of the National Curriculum. Last exams are June 2018, with a re-sit opportunity in June 2019.